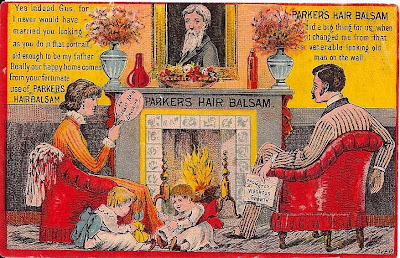 And now, a message from Dusty Diary's corporate sponsor: PARKER'S HAIR BALSAM. Readers, Dusty Diary here. 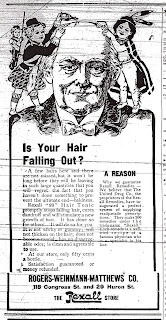 Do you have thinning, brittle, or lackadaisical hair? Do you look in the mirror and sigh? Is it pallid, squalid, putrid, torpid, or tepid? Are you distracted? Feel inadequate? Not as hirsute as other men? Like to be as shaggy as a buffalo? You need PARKER'S HAIR BALSAM. Don't take my word for it. 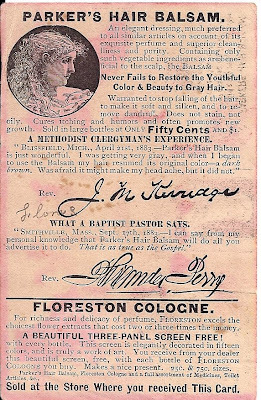 Just read for yourself what a Methodist Minister in Blissfield, Michigan has to say: "I was getting very gray, and when I began to use the Balsam my hair resumed its original color--a dark brown. Was afraid it might make my head ache, but it did not." Of course not. The beneficial vegetable blend in PARKER'S HAIR BALSAM is gentle and bears a sweet perfume. Merely spread our compound of water hemlock, angel's trumpet, and soothing pine resin thickly on the scalp (hats not advised). In just days, you'll have all sorts of stuff up there. Remember: PARKER'S HAIR BALSAM. 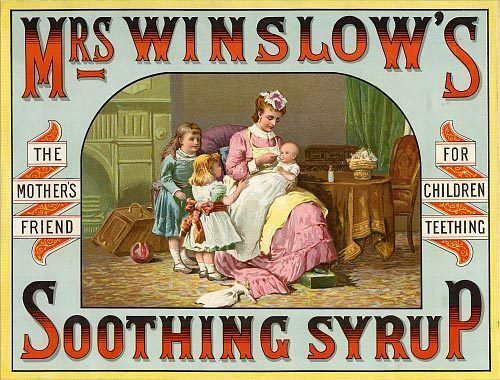 Available at all Ypsilanti druggists. That's the title of my usual Friday "Tidbits" column over at AnnArbor.com: if you like you can read it here. You may remember that last week Allie was buzzing about during her summer vacation, visiting and being visited by friends. July 31 Fri. Marion and I went to Cora Guy's today. We had an excellent time. I drove. Did not get home until real late because one of the horses lost her shoe. Marion read to me part of the way. The book is nice, "The rich, wide world." Aug. 1 Sat. Went up town in the morning to do the trading. In the afternoon read and arranged [sister] Marion's waxed wreath for her and learned how to make some of the flowers. [Other sister] Mary and I went up town in the evening. Saw and talked with Mrs. Hewitt. Went up to Joe Wilcox's. Aug. 2 Sun. Didn't go anywhere all day, but stayed home and read. Intended to go to Church in the evening, but there was no church at ours, so did not go and it happened that there was none anywhere except the Episcopal. Aug. 3 Mon. Went up town early in the afternoon, met Joe and so went home with her. Had a fine time. Mrs. Williams was here in the afternoon. Mary is working with all her might to get ready to go to Detroit. Marion and I went up to Aunt Lizzie's and stayed until the trunks were most packed. Aug. 4 Tues. Got up real early this morning, went over to the depot with Mary. Saw and spoke with Mr. Dull (?). Carrie N. called here this morning. M. Worden and baby are here now. Jenny Shipman called in the afternoon. After that, Marion and I went up to C.N.'s. Nice time. Went up to Joe Wilcox in the evening. Uncle John has taken his meals here today and will until Auntie comes home. Aug. 5 Wed. Went up to Joe's in the afternoon and stayed to tea. Went down town after supper and then back to her house. Did not come home until after eight. We had a grand time. Joe told me some things which both surprised and pleased me [ooh, please do tell us! -ed.] Got a letter from Mary (all well). Aug. 6 Thurs. Worked almost every minute of the forenoon, sewed and read in the afternoon. Went up to Joe Wilcoxx's in the morning with Marion and stayed until dark. Went over to Mr. Busby's in the evening to take the milk. Stayed a little while. Aug. 7 Fri. Got a letter from Carrie N. tonight. Had a call. Worked all forenoon at the ---- and pieced all of hte afternoon. Marion and Ma went out riding tonight after supper and I had to do all the work alone. Broke a dish [hmm, just coincidence I'm sure --ed]. Thanks for reading; tune in next Friday for another chapter!. All righty. So Dusty D and her sweetie were biking along River street the other day and ducked into a side street on the way home, just to investigate it. And what do I see but a colorful garage door mural, totally off the beaten path, where nobody goes. Dusty D pulled out her ever-ready camera, gloating. "Ha! They'll NEVER get *this* Mystery Spot!" Of course it was guessed within minutes. 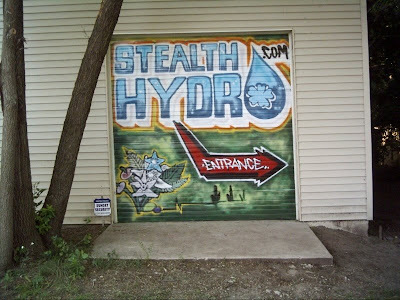 It's Stealth Hydro just off River St., opposite Highland Cemetery, on the tag end of Holmes Road. Lisele mentioned that this is near the home of the person who kindly informed Dusty D about the lions in Highland Park. Dang nab it, this town is too darn small & too many people know each other for any more Mystery Spots! Or so I thought until I glimpsed the doozy a reader sent in. Um, it, uh, ah, stumped me. YES, I'll admit it, it stumped me (grumbles). But! How about you? Answer next Wednesday! 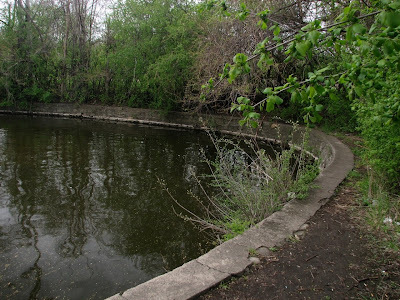 One of the old stories that haunts me is now over on AnnArbor.com. It's the tale of onetime Normal School (EMU) student Lora Bryant, and how (but not why) she ended up in a Montana slum. You can read it here, and I would welcome your speculations and comments as to her weird tale over there! 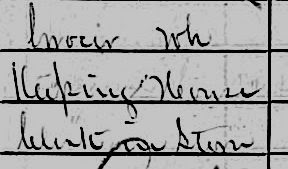 Here's a great example of how puzzling the census records can sometimes be. This is a clip from the 1870 census pertaining to a Detroit resident who moved to Ypsi two years later. What on earth is his occupation, pictured here? Underneath is his wife, "Keeping House," and one of his sons, "Clerk in Store," but I can't for the life of me puzzle out his job. Kind readers may recall that Carrie was suffering a mysterious illness, with her colleagues covering for her summer classes at school. July 27 Sun. Dr. Breakey + Mrs. Niblack think maybe I can go to my 7-8 class tomorrow. Several callers. July 28 Mon. Could not go up to Normal. Miss Wigal took my 7-8 class. Other classes off. O! I hope I can go tomorrow. July 29 Tues. Taught all my classes. Very tired. Lillian took Miss Niblack and me for a long ride after supper. Called at Dr. Breakey's. First public market down town. July 30 Wed. Taught all classes. Rested all time between classes. Mrs. Niblack with me still. Bad liver & stomach still troublesome. July 31 Thurs. Am thankful that I can teach my classes. Dr. B. called + now am taking HCl after meals. Aug. 1 Fri.Mr. O. L. Morris called this morning. The family is going to Portage Lake for 1 mo. Meet all classes. Mrs. Niblack here yet. Aug. 2 Sat. Lounged about all day. Am feeling a little better. Am planning to take a trip down the St. Laurence with the Lewises. "Mother wants your sifter," said Miss Ianthe Howard, a young lady of six years' standing, attired in a tattered calico, thickened with dirt; her unkempt locks straggling from under that hideous substitute for a bonnet, so universal in the western country [Michigan], a dirty cotton handkerchief, which is used, ad nauseam, for all sorts of purposes. "Mother wants your sifter, and she says she guesses you can let her have some sugar and tea, 'cause you got plenty." This excellent reason, "'cause you've got plenty,' is conclusive as to sharing with your neighbors. Whoever comes into Michigan with nothing will be sure to better his condition; but woe to him that brings with him anything like an appearance of abundance, whether of money or mere household conveniences. To have them, and not be willing to share them in some sort with the whole community is an unpardonable crime. You must lend your best horse qui que ce soit to go ten miles over hill and marsh, in the darkest night, for a doctor; or your team to travel twenty after a 'gal,' your wheelbarrows, your shovels, your utensils of all sorts, belong, not to yourself, but to the public, who do not think it necessary even to ask a loan, but take it for granted. 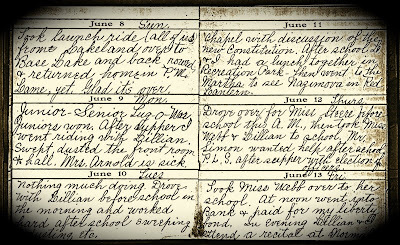 The two saddles and bridles of Montacute [Clavers' Michigan town] spend most of their time travelling from house to house a-man-back; and I have actually known a stray martingale [horse tack] to be traced to four dwellings two miles apart, having been lent from one to another, without a word to the original proprietor, who sat waiting, not very patiently, to commence a journey. Then within doors, an inventory of your plenishings of all sorts, would scarcely more than include the articles which you are solicited to lend. Not only are all kitchen utensils as much your neighbor's as your own, but bedsteads, beds, blankets, sheets, travel from house to house, a pleasant and effectual mode of securing the perpetuity of certain efflorescent peculiarities of hte skin, for which Michigan is becoming almost as famous as the land "'twixt Maidenkirk and John O'Groats'." Sieves, smoothing irons, and churns, run about as if they had legs; one brass kettle is enough for a whole neighborhood; and I could point to a cradle which has rocked half the babies in Montacute. For my own part, I have lent my broom, my thread, my tape, my spoons, my cat, my thimble, my scissors, my shawl, my shoes; and have been asked for my combs and brushes: and my husband for his shaving apparatus and his pantaloons. But the cream of the joke lies in the manner of the thing. It is so straight-forward and honest, none of your hypocritical civility and servile gratitude! Your true republican, when he finds that you possess anything which would contribute to his convenience, walks in with, "Are you going to use your horses to-day?" if horses happen to be the thing he needs. "Yes, I shall probably want them." "O, well, if you want them--I was thinking to get 'em to go up north a piece." Or perhaps the desired article comes within the female department. "Mother wants to get some buter: that 'ere butter you bought off Miss Barton this mornin'." And away goes your golden store, to be repaid perhaps with some cheesy, greasy stuff, brought in a dirty pail, with, "Here's your butter!" A giel came in to borrow a "wash-dish," "because we've got company." Presently she came back: "Mother says you've forgot to send a towel." 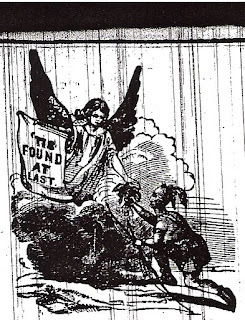 Mystery Artifact in AA News: You're Invited to Guess! Every Monday I do a Mystery Artifact for AnnArbor.com. Today's just went up. Now, the folks here have an advantage in guessing--you have honed your skills on many a previous Mystery Artifact, you know the kinds of things I pick, and so on. 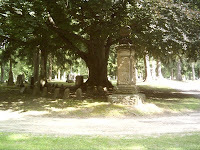 So traipse on over there if y'like and school those folks on how to demystify Mystery Artifacts! It's a new one, never posted on the blog. I can assure you that between this blog and AnnArbor.com, I'm a-hoppin' all over this county, scouring our every last cobwebby corner for Mystery Artifacts! There's only so many of them, y'know! Sooner or later I'm gonna run out! So while they last, have some fun over at AnnArbor.com. Link to Mystery Artifact. Sandy D. correctly guessed that last week's Mystery Artifact is a corn husker! Yay! You can see it here in the 1902 Sears Catalog. 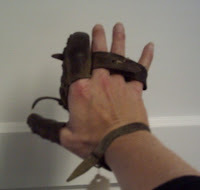 It's the sixth glove down, just one of the many models of corn husking gloves offered. They're sold singly, in pairs, and in lots. 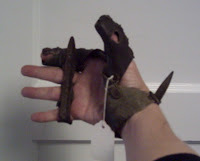 So it's reasonable to deduce that people wore these on one or both hands. Holding the dried corncob in one hand, they gripped it with their other hand, and rasped off the hard dry kernels. There's also a big box-style crank corn husker at the Museum which did the job in a fraction of the time. Either the glove was used by poorer farmers who couldn't afford the box husker, or the gloves were used in conjunction with it, to clean off any cobs the machine did not fully strip. The metal ridge in the palm side of our glove forced off the kernels. 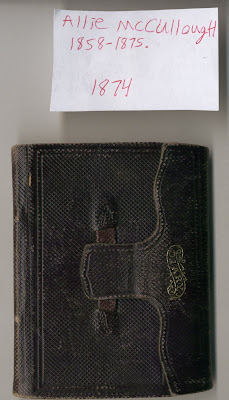 This week's Mystery Artifact appears in a photo. What, pray, is this man doing? At one time it was done all over town, and was an important job. But what is it? Do you recognize this action? Take your best guess and good luck! Answer, and a New Mystery Artifact, next Friday night! The exploding-stove guy stopped to put his trousers on. (Rolls eyes). Perhaps he took a moment to select a matching cravat, and maybe arrange his hair just so with some Dippety-Doo. When your sister yells "THE GAS STOVE EXPLODED!!!" that is not a signal for sartorial musing. Go, man, go! Over at the electric demo, the stove has 3 settings. Period. Low, medium, high. So for those of us used to baking bread at 350 for 40 minutes--outta luck. You had to guesstimate it; temperature settings didn't come along till later. But at least you didn't end up jumping out of windows right and left. The story reads like a press release, does it not? Coincidentally, I hope, there's a nice big ad for the Electric Co. right next to it. It shows the menu for the next electric stove demo, headed by Chicken a la Wilke, a dubious amalgam of peas, eggs, cornstarch, and chicken. There are also mac n cheese and coffee and cake. Though Dusty D is one of those snooty (natural) gas-stove snobs, the electric stove must have been a godsend to housewives who, you know, were tired of their stoves exploding all the time, dangit. You may remember that last week Allie was having a very social summer vacation. 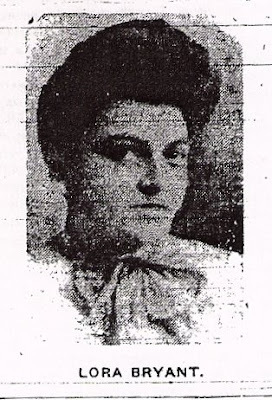 She received visits from Aunt Lizzie, Uncle John, Cousin B., and visited her girlfriend Joe, Mrs. Johnson--and received a call from the handsome Alfred Lucking. She also made a hat and sewed a dress for herself over several days. July 24 Fri. Rained very hard last night and this morning. Sprinkled all day. Joe came down in the afternoon and we had a good talk. I went up to the Post Office with her. Met mamie H. and Hattie H. Then went and took a long walk. Ma has not got home. A. L. (Alfred Lucking) called a second this evening. July 25 Sat. Uncle John was intending to go to Flat Rock today so I dressed and got everything ready to go down to Carrie's with him, but it commenced to rain and we did not go. Was some provoked, but it could not be helped. It has rained all day. Went up town in the evening a little while. Uncle T. (Tom) was here all the evening. July 26 Sun. It has rained almost all day so, of course, I did not go to church, but read and wrote a letter to Carrie. Went to church in the evening. July 27 Mon. Helped wash today and sewed on my dress. Ma and I went to call. Carrie acted very well and I had a nice time. Marion came for me and we went over to hte depot, then walked around through town and then home. July 28 Tues. I got a note form Joe this noon asking or rather demanding that I should come up there in the evening. I went. We took a long walk and had a glorious time. Pa came home this afternoon. Aunt Lizzie and Mrs. Wilson called here. I have got my dress done and wore it this eve. July 29 Wed. The door bell rang this afternoon. I went to the door and who should it be but Carrie M. She had not been here long when Joe H. came. They stayed to tea. We spent a pleasant afternoon. After supper Will drove around with the horses. We took a long pleasant ride. Went to C.'s to stay all night. July 30 Thurs. Came down this morning with Carrie. We had a nice time last night. Went over to Mary Worden's this afternoon, had some fun. Read and pieced and played all day and fluted Marion a polonaise and it looked beautiful. Had some callers. July 31 Fri. Marion and I went to Cora Guy's today. We had an excellent time. I drove. Did not get home until real late because one of the horses lost her show. marion read to me part of the way. The book is nice, "The rich, wide world." Link to my bio describing when I'll be publishing what 3 times a week. When I post new stories, they pop up here in this list. 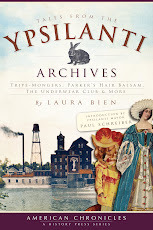 Link to my story "Locavores in 1930s Ypsilanti"
Link to my story "Tidbits: A History of Ypsi Chickenry." You are free to leave comments over there. For every AnnArbor.com story, there's a "comment" link at the top right side. As you look through the rest of AnnArbor.com, you can also vote for your favorite stories. Kind readers may recall that city Fire Inspector John Roe very kindly gave of his time to accompany Dusty D and her ninja corps to Water Street. Turns out he was a former customer of this metal salvage and recycling operation. Mr. Roe kindly answered some follow-up questions, which I post here with thanks to him. 2. DON'T KNOW ABOUT THE RECYCLING. I-BEAMS, BASEMENT POST, FLAT STEEL STOCK, LINTEL'S FOR OVER WINDOWS AND DOOR OPENING, FOR LAYING BRICK ON, ANGLE IRON, ROUND AND SQUARE STOCK, RE-ROD FOR BASEMENT FOOTINGS, WIRE MESS FOR PLACING IN DRIVEWAYS AND SIDEWALKS. the building where they sawed up metal? 3. THE HOLE IN THE FLOOR WAS A SCALE FOR WEIGHTING STOCK AND THE BUILDING HOUSED THE TRACTOR THAT WAS USED FOR MOVING THE STEEL AROUND. 4. 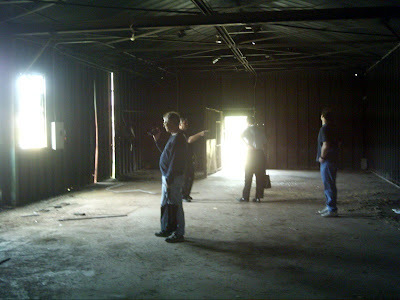 The second building was a big aluminum warehouse. Was something stored here? 4. THIS BUILDING WAS USED FOR BUILDING AND WELDING CUSTOM PIECES FOR CUSTOMERS. where we climbed in the window? 6. We found slag--was there a smelter or incinerator on the site? 6. I DON'T BELIEVE THERE WAS, BUT A LOT OF CUTTING STEEL WITH TORCHED HAPPEN ON THIS SITE. 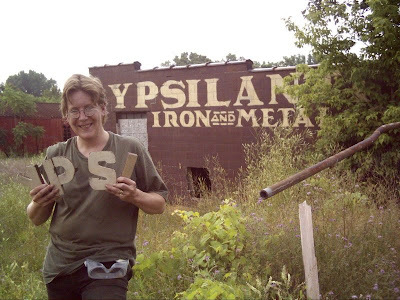 become part of Ypsi Iron and Metal? visiting here back when it was active? 8. NOT TOO BAD FROM WHAT I REMEMBER. 9. What else about the site is interesting that I haven't asked? 9. THIS WAS A PLACE WHERE YOU WENT TO GET VEHICLES, TRAILERS AND OTHER THING WEIGHTED FOR YOUR LICENSE PLATES. 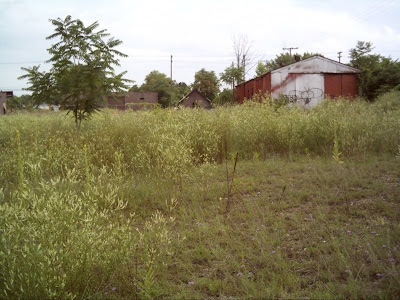 A YARD WHERE CONTRACTORS PURCHASED STEEL FOR COMMERCIAL AND RESIDENTIAL BUILDING. Thanks to Mr. Roe for sharing his recollections of this Water Street site. 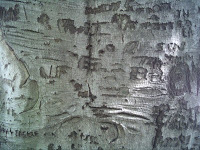 Dusty D hoped to stump readers with a close-up of Highland Cemetery's famous "trysting tree," the enormous copper beech covered with decades of lovers' inscriptions. Nope. A gentleman in Dearborn (formerly of Ypsi) nailed it. The tree is just a bit north of Starkweather Chapel. Turn right and walk till you hear yourself saying "Holy ******* ****!" That's the one. Here's a background tale of the Trysting Tree, Ypsilanti's only named tree (click for readable size). It's written by Eileen Harrison, my favorite former local history writer. She's good. This week we move away from the natural world to a man-made structure. The only clue you'll get is that it's not terribly far from the Trysting Tree. Take your best guess, and good luck! I took a tour today of Water Street, onetime blue-collar district in Ypsilanti, that left me desolate. Hours later I figured out why a rock felt lodged in my chest. The empty buildings represent my father. He was a printing press mechanic for Heidelberg company for over 25 years. His workshop, with milling machine, drill presses, an antique and dangerous 19th-century bandsaw, 2 lathes, and thousands of hand tools, signifies an invisible library of skills honed over a lifetime. Refined and accurate, these skills allowed him to create model steam engines, whose tiny size meant zero margin of error. They worked. He kept the presses running, with hand-made parts. The perfection of things he created out of slabs of metal ensured that thousands of people continued to receive their paper every day without incident. His accomplishments were invisible, but the bearings and cams and gears he made were visible—all over the workshop, just under my bedroom, throughout my childhood. The milling machine’s whine kept me awake, frustrated, on school nights. Water Street’s ruin testifies to the sensibility that cannot see beauty in a precision-milled part or an elegantly-turned shaft from a lathe, and that has no idea of the focus, delicacy, and skill required to make the physical things enabling the functions of everyday life in a car or a house or a printing press. From scratch. 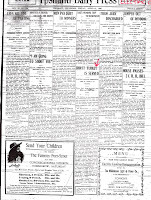 It would be wrong to say “market forces” eliminated the blue-collar businesses on Water Street, In 2002, according to the Ann Arbor News, Water Street’s 38 acres consisted of 36 properties with 18 businesses. 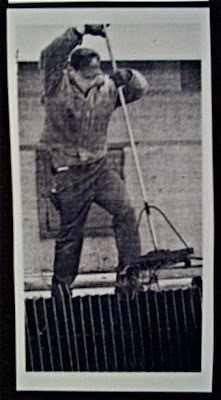 Onetime businesses included Dave Love’s automotive shop, Jim Fagan’s First Class Services, and Ypsilanti Iron and Metal. 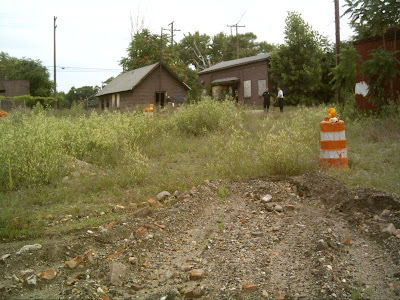 When 10 property owners refused to sell to the city, the city condemned the entire site. By 2004, the city had acquired all the land. Once a busy and noisy metal supply and recycling site, where construction crews came in to have I-beams sawed to length for house foundations, Ypsi Iron and Metal stands empty. Its four battered buildings have been stripped of metal and wire by methheads and drunks. 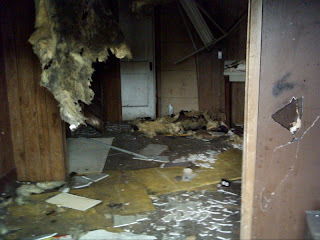 Broken glass, dirty yellow insulation fluffs, and an occasional squatter’s fast-food bag litter the interiors. We could salvage only a few artifacts for the Museum. 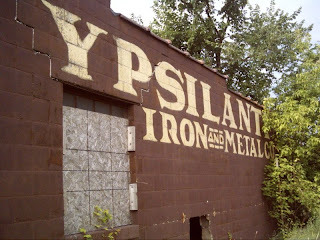 The best of them was a set of letters from the onetime “YPSILANTI IRON & METAL CO.” sign. These were teased off the front of the building with a crowbar. Luckily for the Museum, the crackhead street value of hand-sawed, hand-shaped Art Deco letters is zero. This is my love letter to Water Street. Your buildings represent my own experience of blue-collar work that enabled a mechanic’s daughter to get enough college education to disparage her middle-school-dropout father’s prejudices, while moving into circles closed to him. Water Street represents the industries that built this town from the beginning, and the artistry in a handmade car part buried unseen in the engine. Sparks and clangs and curses once jangled the now-silent ruins. Wandering south from the buildings, an explorer can find old ceramic fuses, a glass insulator, and maybe a gear. Shoes crunch over shards of brick and glass, until the quiet of the place forces a pause. Water Street is silent. Wind moves through the purple-flowering weeds, as distant broken windows stare like black eyes. Kind readers may recall that Carrie was just starting out teaching summer classes at the Ypsilanti High School, until illness struck her down. July 22 Tues. Taught all classes, but it was not easy work because of not feeling well. July 23 Wed. Taught all classes but feeling miserable. July 24 Thurs. Can't keep anything down. 7-8 class excused. Miss Wigal taught P.M. classes. Lillian with me. Dr. Breakey came again. July 25 Fri. Could not teach today either. Feel a little better. Could not teach. Dr. Breakey came. July 26 Sat. Mrs. Niblack came this A.M. My, I'm sick with liver and stomach trouble. Am having a time. Dr. Breakey again. How do you "get the ear of the man you want to reach"? Why, you shoot it off, of course. You can see the little ear bits flying off there in a spray of gore. Presumably the shooter picks them up. There you go. You got the ear. But probably not an eager attendee of your auction sale. A hair product that sounds like a snake poison is not exactly appealing. 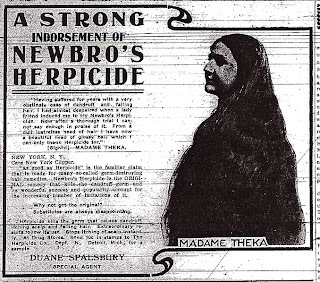 "Madame Theka" complains about dandruff, and her carnivalesque moniker does suggest flakiness. 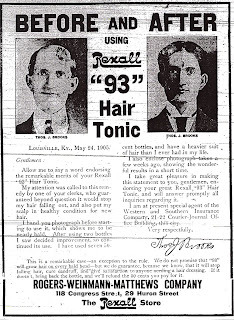 On the manly side of hair potions, Rexall's "93" is the tonic for you if you wish to grow a third eye of wisdom. Dusty D remembers reading about this tonic in her beloved book Nostrums and Quackery, published by the infant AMA, back in the day. They tested it, and found it to be worthless. Nothing suggests hair regeneration more than a miniature Scotsman and a Native American perched on one's shoulders. The recipient of their attentive massage looks perfectly sanguine about the situation. Even a bit dreamy. This is another ad for ol' "93." Gives you the Third Eye of Wisdom, makes you dreamy-eyed, and then small ethnic stereotypes appear out of the woodwork and become your friends. What's in that stuff, anyways? You are what you wear. Would the recipient of a present of this lovely dog-fur coat develop an uncontrollable urge to heel, beg, pee outdoors, and roll over? 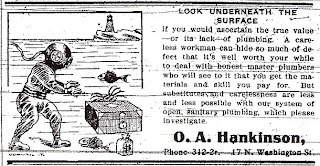 "Get your plumbing from us, and your house, 'underneath the surface,' will be like an ocean." As opposed to a nice dry basement. Slightly unfortunate image choice here. Though the li'l crab is cute. Not that you'd want crabs in your basement either. 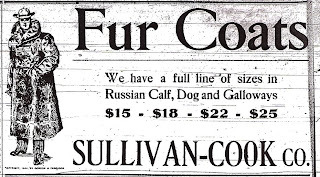 And that's tonight's roundup of dubious 1906 advertisements! Heads Up: Huge Sale in Depot Town this Saturday! Contest: What was Carrie Hardy's Water Bill? Proposal to Rename Ypsilanti's Huron St.
Wednesday Mystery Photo: Wood You Know? Why Does Ann Arbor Have No Historical Museum? Dusty Diary will Appear on AnnArbor.com! Yippee!